Comments: Thayer’s Gulls breed in small colonies on coastal cliffs on arctic islands. They are most likely to be confused with Herring and Iceland gulls. Adults have a yellow bill with a red spot and sometimes a green base. Eye color is usually dark, but may appear yellow under some lighting conditions. A reddish-purple eye ring is present during the breeding season. The outer primaries show a distinct black with white pattern. 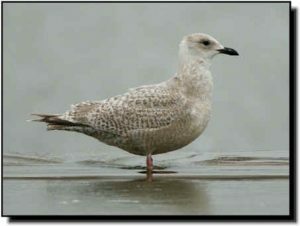 Thayer's Gulls occur in small numbers or are found only in localized sites within the Great Plains.